Inside. Outside. Tracks & Screens. Most Materials, Sidings & Surfaces. Professional window cleaning with over 12 years experience. We hand clean your windows for sparkling clean windows without streaks, smears or drips. Moss, algae and lichens grow profusely in the cool, wet weather in Western Washington. It is important to clean your roof regularly to avoid damage. Regular gutter cleaning is the single most important key to avoiding major, expensive home repairs. Gutter cleaning is recommended twice a year, but if you live in an area with many trees you might need this service more often. Clean & Clear Windows will remove moss from your roof, siding, driveway, walkways and other surfaces. We offer two moss treatment options. EPA approved powder that is safe for your plants, siding, and does not stain in any way. We recommend this 2x/year. Spray treatment that is ideal for tile and wood roofs, sidings, walkways, and driveways. We recommend this 1x/year. Pressure washing is not an easy task. Professional equipment and trained technicians is important. Clean & Clear Windows has 12 years of experience and proper tools to do the job right and avoid lines, marks and damage to surfaces and sidings. We work with you to get your desired look at the right budget. Roof lines, roof hips, entry ways, around windows, driveways & paths, garage doors, mini lights on trees, to show Holiday Spirit your way. This company is great. Returned my call quickly, arrived on time for both the free bid and the actual work….and did a FANTASTIC job cleaning my roof and windows. Steve has been cleaning windows and gutters for us the last three years and is always responsible and respectful. Steve and his assistant were on time and did a GREAT job. They clean the windows inside and out. 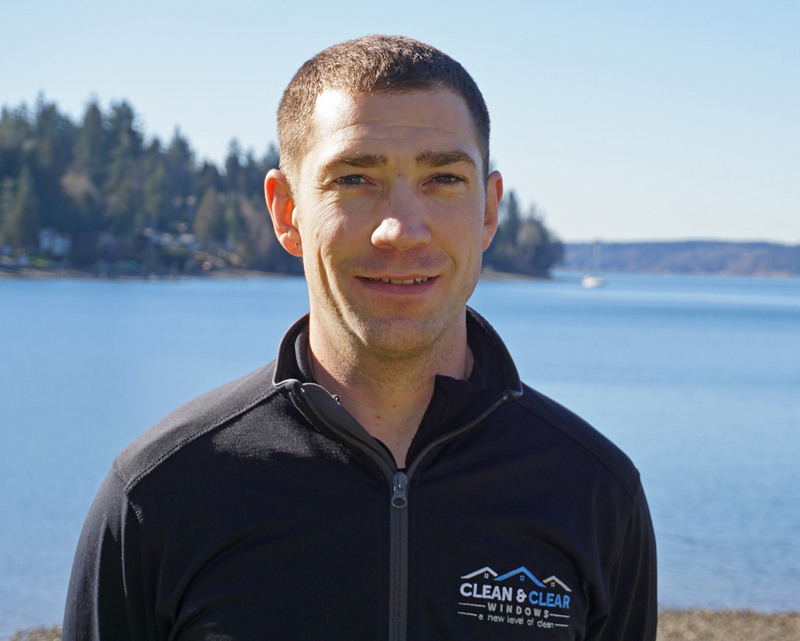 I’m Steve Greco, owner of Clean & Clear Windows. My crew and I take pride in our work, believe in excellent service and a job well done. Being a Washing state contractor with full bonding and insurance, you can have the peace of mind that we have you covered. Your satisfaction is our goal on each project. I look forward to helping you with your home maintenance projects. We are based in Gig Harbor and service Gig Harbor, Port Orchard, Tacoma and surrounding towns in Pierce and Kitsap Counties. Call or text 253-225-3630 or email to discuss your project and get a free estimate. Do you wear safety harnesses? For roofs of a hazardous pitch we always wear safety harnesses and equipment to ensure the safety of our crew and to put your mind at ease. Are your workers covered on your insurance? Yes! Clean & Clear Windows’ workers are employees covered by our 2m policy. You can rest easy and not worry about any risk while we are on the job. Many companies use contract workers who are not covered leaving you exposed to risk from any injuries occurred on the job. Do you use environmentally friendly cleaners? We use different cleaning solutions depending on how severe growth is. We will use eco-friendly solutions exclusively at your request.